Let’s talk football. The Jets finally clawed their way into the post-season and Saturday was all about screaming wildly at the TV and rooting for my boys to pull through for New York. I always whip up some pretty tasty football snacks to enjoy during the game. What’s the point of football without something to munch on? That’s half the reason I decided to like the sport! This week I really craved a burger. I bought Hubert Keller’s Burger Bar cookbook a few months ago and decided to skip right past the fattening yet delicious beef recipes to try a garden variety. 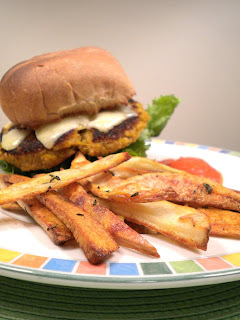 I decided on a ROASTED BUTTERNUT SQUASH-QUINOA VEGGIE BURGER with CARAMELIZED SHALLOTS and PIQUILLO PEPPER KETCHUP served with a side of GARLIC THYME OVEN FRIES. Alright, it sounds a little fancy dancy. But, if you’re going to forego the juicy deliciousness that is beef, the veggie counterpart better pack a big punch. I hit up Whole Foods, which is quickly becoming my favorite place on earth, for some inspiration. I made a few slight adjustments to the original directions substituting whole wheat breadcrumbs for the potato flakes it originally called for. If your supermarket carries whole wheat ciabatta rolls, I would highly recommend it. The dish could use the extra crunch. The end result? A delicious veggie patty with a slight hint of sweetness. The caramelized shallots add a “meaty” richness without any actual meat. The patty is topped with Greyere cheese. I’m a supporter of one big “splurge” ingredient per dish, but keep it to one. There’s a time and place for light cheese, but go for the real stuff here. It melts nicely and adds a creaminess that’s reminiscent of a real cheeseburger. The Piquillo Pepper Ketchup is tangy and acidic and made with a small amount of honey rather than the sugar-packed, store-bought Heinz 57. A burger is never complete without fries. Oven roasting allows you the luxury of a crunchy potato without the fried calories. Just keep those white starches to a minimum. These were so tasty; I didn't even miss the moo. Hi, I'm a friend of Mary Ann's - love your blog - but you the name of Whole Foods wrong - it's Whole Paycheck! :-) but I love it too. It's a foodie's dream. 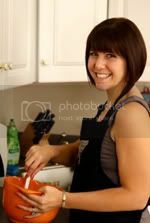 I'm an avid cook and baker and have hundreds of cookbooks - but my main blog is all about motherhood and having a child with autism. Happy New Year.